Domperidone microspheres for intranasal administration were prepared by emulsification crosslinking technique. Starch a biodegradable polymer was used in preparation of microspheres using epichlorhydrine as cross-linking agent. The formulation variables were drug concentration and polymer concentration and batch of drug free microsphere was prepared for comparisons. All the formulations were evaluated for particle size, morphological characteristics, percentage drug encapsulation, equilibrium swelling degree, percentage mucoadhesion, bioadhesive strength, and in vitro diffusion study using nasal cell. 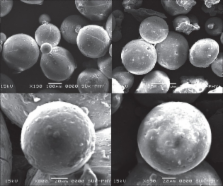 Spherical microspheres were obtained in all batches with mean diameter in the range of above 22.8 to 102.63 μm. They showed good mucoadhesive property and swelling behaviour. The in vitro release was found in the range of 73.11% to 86.21%. Concentration of both polymer and drug affect in vitro release of drug. Nasal drug delivery--possibilities, problems and solutions. This paper discusses the problems associated with nasal drug delivery and how it is possible, sometimes by means of quite simple concepts, to improve transport across the nasal membrane. In this way it is feasible to deliver efficiently challenging drugs such as small polar molecules, peptides and proteins and even the large proteins and polysaccharides used in vaccines or DNA plasmids exploited for DNA vaccines. The transport of drugs from the nasal cavity directly to the brain is also described and examples of studies in man, where this has been shown to be feasible, are discussed. Recent results from Phase I/II studies in man with a novel nasal chitosan vaccine delivery system are also described. Finally, the author's thoughts about the future for nasal drug delivery are also depicted. Copyright 2002 Published by Elsevier Science B.V.
Nasal route and drug delivery systems. Nasal drug administration has been used as an alternative route for the systemic availability of drugs restricted to intravenous administration. This is due to the large surface area, porous endothelial membrane, high total blood flow, the avoidance of first-pass metabolism, and ready accessibility. The nasal administration of drugs, including numerous compound, peptide and protein drugs, for systemic medication has been widely investigated in recent years. Drugs are cleared rapidly from the nasal cavity after intranasal administration, resulting in rapid systemic drug absorption. Several approaches are here discussed for increasing the residence time of drug formulations in the nasal cavity, resulting in improved nasal drug absorption. The article highlights the importance and advantages of the drug delivery systems applied via the nasal route, which have bioadhesive properties. Bioadhesive, or more appropriately, mucoadhesive systems have been prepared for both oral and peroral administration in the past. The nasal mucosa presents an ideal site for bioadhesive drug delivery systems. In this review we discuss the effects of microspheres and other bioadhesive drug delivery systems on nasal drug absorption. Drug delivery systems, such as microspheres, liposomes and gels have been demonstrated to have good bioadhesive characteristics and that swell easily when in contact with the nasal mucosa. These drug delivery systems have the ability to control the rate of drug clearance from the nasal cavity as well as protect the drug from enzymatic degradation in nasal secretions. The mechanisms and effectiveness of these drug delivery systems are described in order to guide the development of specific and effective therapies for the future development of peptide preparations and other drugs that otherwise should be administered parenterally. As a consequence, bioavailability and residence time of the drugs that are administered via the nasal route can be increased by bioadhesive drug delivery systems. Although the majority of this work involving the use of microspheres, liposomes and gels is limited to the delivery of macromolecules (e.g., insulin and growth hormone), the general principles involved could be applied to other drug candidates. It must be emphasized that many drugs can be absorbed well if the contact time between formulation and the nasal mucosa is optimized. Isolation and purification of human endometrial stromal and glandular cells using immunomagnetic microspheres. Hepatic arterial embolization with doxorubicin-loaded superabsorbent polymer microspheres in a rabbit liver tumor model. Efficacy of mitoxantrone-loaded albumin microspheres for intratumoral chemotherapy of breast cancer.